In 1894 the Wright Brothers’ first flight was still nearly a decade away. But people were obsessed with figuring out how to use powered flight for any number of applications. The May 5, 1894 issue of Scientific American featured one such idea—an aero-train that could zip across the country at 150 miles per hour. In the present issue we illustrate a proposed high speed railroad, in whose operation aeroplanes take a part. By this system the attainment of a speed of 150 miles an hour is claimed to be possible, while for long distances a rate of 125 miles an hour is hoped for. The projectors hold that the railroad of the present time must be supplemented by some system admitting of higher speed. Interestingly, one of the problems that the people at Scientific American saw with this proposal was that you couldn’t have dramatic turns. This is precisely one of the biggest hurdles that modern day engineers have pondered when it involves the Hyperloop, albeit for different reasons. To reach this speed, curves must be abolished, as the centrifugal force will be too great to be withstood. Accordingly, as far as possible, the line will go right across country from point to point, without regard to grade. Next, the road must be free from interruption; there must be no possibility of any obstacle getting on the track. This makes an elevated structure the proper one, and the one shown in the cut has been designed to secure the essential features of strength and safety. It includes an upper and a lower pair of rails, and a pair of trolley wires or leads. The magazine invokes the “comforts of the Pullman car,” in reference to the Pullman train cars that would become the industry standard for pleasant travel in the 19th century. The cars are of special design, with sharp ends, so as to encounter the minimum of air resistance. In cross section they are of sufficient dimensions to present the comforts of a Pullman car. They will have a trussed steel frame and metal sides, tops and floors. They are carried by wheels four to six feet in diameter, which wheels are to be placed near their tops, so that the cars will be virtually suspended from the upper rails. The axles of these wheels pass through journals near the car roof. One or more pairs of these wheels are to have two electric motors connected to their axles, so as to serve as driving wheels. The speed being so high, there will be no trouble in using direct connected motors without gearing. But their quest for a high-speed train would not come to pass. One imagines this would be for so many reasons, but chief among them is the acknowledgement in the article that not only would they have to avoid dramatic curves, they’d have difficultly ascending any steep climb. When you picture a route from San Francisco to New York one can’t help but see a problem, then. What do you do when you hit the Rocky Mountains? 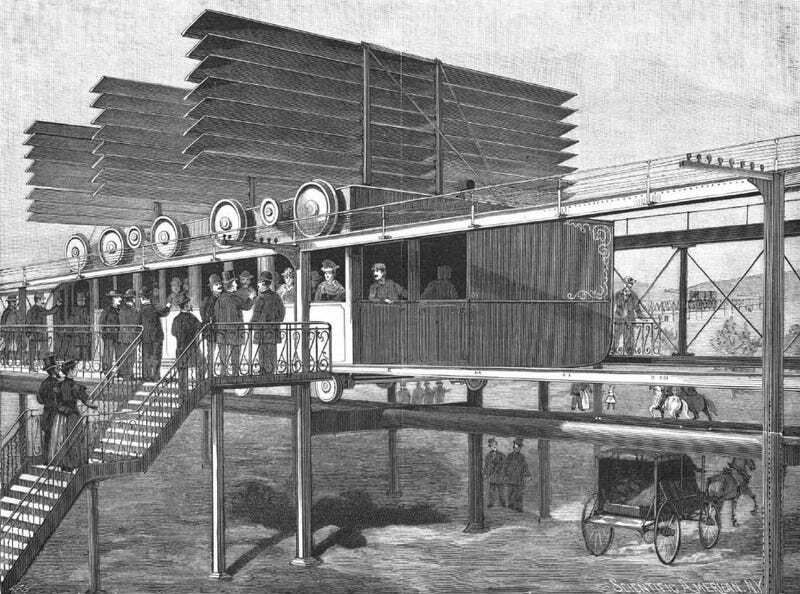 If you’d like to read the entire article on this aero-train of the 19th century you can view it at Archive.org.